Penguin 2.0 was released in May of 2013, and despite its name was actually the fourth update of the Penguin algorithm. It was called “2.0” because it was only a revision, not a complete renewal. In Emphasize Design of Calgary’s post “Google’s Panda 2.0 Fights Webspam: Calgary Internet Marketing News” we discussed what it meant for SEO experts and how to respond if necessary. As with most things in life, the changes meant a lot or very little…depending on how you looked at things! A lot of Google’s alterations were based on providing good content, and those that took the time to develop their websites thoughtfully in the first place had little to worry about with regards to ranking. Keywords are still essential, but must be relevant. It’s more important than ever to make sure your content exactly matches your keywords. Penguin 2.0 is super-adept at recognizing keyword stuffing, though, so avoid this practice at all costs. In fact, all content that appears to use specific terms much more frequently than they would in average conversation may be downgraded to webspam. Google is taking a more active role in improving the user’s experience altogether, and those ignoring the Penguin update may be completely removed from Google’s indexing system and having to appeal for ranking again. It may seem like a heavy price to pay, but all you have to do is supply quality content and relevant keywords to avoid irking the wrath of the folks on Google’s Search Quality Team. And we’ve discovered as we’ve been working more and more with the Penguin that the modifications can benefit both your website and your business. Content marketing has come a long way. It’s become about providing real information for everyday people who simply want to find an answer on the Internet. Frame your marketing techniques towards meeting this very obvious need and you’ll find the results will be content that works for you and your business. How do people try to find things out? They ask questions of course! 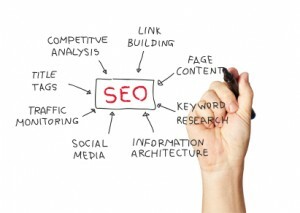 To improve your website’s SEO, simply start asking yourself lots of them. What are the most frequently asked questions you receive at your business? There are actually two reasons why this is an excellent approach. The first is by providing a quality answer to a question often asked on your website, you are also providing value to users AND to Google. You’ve made it a lot easier for both to figure out who you are and what you’re up to. So before thinking about keywords, think content. The answer to “Where can I dryclean my wedding dress in Calgary?” organically provides the appropriate keywords for that content. From that simple question we can derive, “where dryclean wedding dress calgary”, “wedding dress drycleaners calgary”, and something along the lines of, “wedding dress drycleaners downtown calgary,” depending on the location of course, which are all good indications of what search engines will find on that page. And believe it or not, search engines actually really do want people to find your site – especially if you’re providing good content – and by providing them with the proper tools they’ll be able to do so easily. Expect that the art of asking and answering questions will become more and more prevalent on the Internet. Google recently introduced Google Instant, where when a user begins to type in a query Goggle helpfully suggests search terms. Google Now is a search app often referred to as a digital personal assistant, and can now reply responses to specific questions about the user provided the information is stored somewhere in their profile. You can ask when you’re supposed to meet your husband for dinner, and where, if you have any meetings and who you need to call. The Internet’s culture of openness demands substance. If you are as passionate about your business as we are at Emphasize Design, then we know you have plenty to talk about on your website. By being a responsive as Penguin 2.0 aims to be we can optimize your content, improve your search engine rankings, tweak your site design and function plus earn you new clients. PreviousPrevious post:What is INBOUND 2013?NextNext post:How Do I Optimize For Search Engines?